Metrodata's BC1X00 family of Baseband Converters allow the latest generation of Serial Link and Bulk Encryption Devices using the LVDS/EIA-644 interface to be connected to satcoms equipment, routers and radio systems. Using Metrodata's Baseband Converters, it is possible to utilize new and existing/legacy equipment with these new fast LVDS link encryptors. Typically used to interface Cisco HSSI Routers to LVDS encryptors, or LVDS encryptors to HSSI satellite Modems or HSSI radio relay systems, the BC1X00 baseband converter family presents a major step in solving interoperability and interfacing issues within Defence networking. 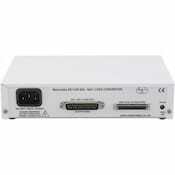 The product range consists of two devices: the BC1100 which connects LVDS/EIA-644 equipment to a HSSI DTE (e.g. a router), and the BC1000 which connects LVDS/EIA-644 equipment to a HSSI DCE (e.g. a satellite modem). With a maximum speed of 51.84Mb/s the BC1X00 Baseband Converters support the maximum rate supported by LVDS encryptors. Cables to connect the BC1000 and BC1100 to a KIV-7M link encryptor are also available. 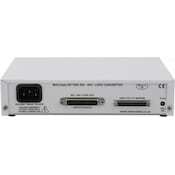 The BC1100 converts between the HSSI router interface and the LVDS satellite modem. The BC1100 operates transparently to the data and can operate at up to 52Mbps which is the maximum operating speed of HSSI router ports and LVDS satellite modems. On the un-encrypted Red side, the BC1100 enables the connection of the HSSI router port to the KIV-7 LVDS/EIA-644 port, whilst the BC1000 enables the KIV-7 to be connected to a standard HSSI satellite modem on the encrypted Black side. The same topology can also be used for radio relay systems.